Na Palapalai, a trio of Hawaiian Falsetto singers, are rocking the joint. Ukulele, Guitar, and Stand-up bass are in perfect synchronicity. Hawaiian calls of celebration, “Cheeee-Huuu”, splash against the walls. Hawaiian music legend Robert Cazimero is pumping his hands in the air beside me. He is supporting the next generation of musicians. Robert turns and looks at me, raises his eyebrows as if to say “Damn, they’re good”, then turns back to the trio with a sweet “Yeee-hooo”. On an average night, this scene would have been typical for Chicko’s. But, tonight, the Tsunami is coming from Japan. It’s 12 o’clock, midnight, and all is well here in Honolulu. I look towards the small stage at Chicko’s, and I see celebration of life through music. I look behind me, and I see death on the large flat screen TV’s, our windows to Japan. An eerie tension builds in the air like sick mist. Black water pours over the sides of the island of Japan in Sendai. One lonely car speeds on a road as the oil slick looking ocean plows houses, cars, and earth. The white car makes it off the screen, and we all hope they got away from the water. Buildings torn asunder are now bathed in dark flow. The news gets worse, as a fire has erupted at the Fukushima Nuclear Power Plant just south of Sendai. The nuclear fall out could have the longest impact on Japan’s recovery. It’s 12:25am, and all is tense here in Honolulu. The musicians are still pumping out fresh Aloha, but it’s time to leave, time to go up the long hill to my home at the foothills of the mountains in Manoa. My partner and I pass half a dozen Japanese restaurants on the way. They all have family in Japan. I feel a sense of ease, and self-gratitude, that I chose a place so elevated and so protected by mountains for our home. I feel sad that there was no place to run for so many of our Japanese neighbors. Bags are packed, food is bundled, we sit and wait. Wait to see what will happen to us, wait to feel an impact. Wait for God to hear our prayers for Japan. It’s 2:30am in Manoa Valley, and all is ready. We are told that our area is safe, so we sit tight, eventually passing out on the couch. Several days have passed since the Tsunami, and we are grateful. And sorrowful. The Japanese and Hawaiians have always had a close relationship long before Hawaii became part of the US. Many Kalo (taro) fields have been converted to hold rice patties. Many Hawaiians still eat rice with breakfast. A scroll of Japanese calligraphy for “patience” hangs beside our bed. 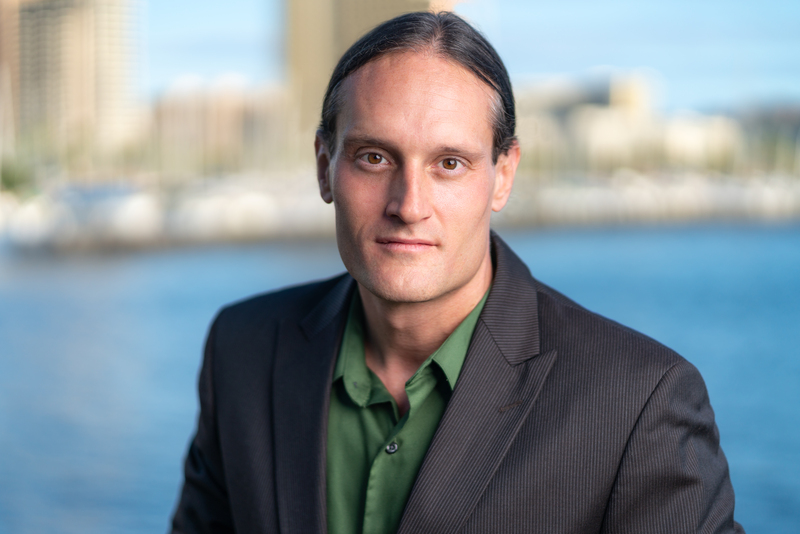 Many Hawaiians have Japanese last names from the mixing of their ancestors. There is an Island people bond. 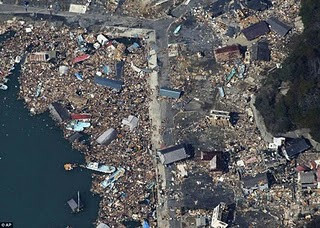 A week later, the tsunami has passed, and damaged homes are left in the wake of the quake and tsunami. How do we find hope? From two steps away in Hawaii, it’s difficult to look at the footage on TV and see the good in this situation. So I take 10 steps back, and look at the greater history to find solace. As the likely nuclear leakage from the damaged power plant remains a threat in Fukushima, I remind myself that this is not the first time that Japan has faced the harmful effects of radiation. Just decades earlier, the Japanese were the enemy of the US after the bombing of Pearl Harbor. Hawaii was not yet a US state, but the shock waves rippled throughout America. My Great Grandmother grew up sewing military uniforms from home. Even in her eighties, she was still hurt and angry at Japan for Pearl Harbor. It was the defining wound of her generation, a pain so great that it was deemed unforgivable. The Pearl Harbor attack contributed to the devastating decision to bomb Hiroshima and Nagasaki in the south of Japan. Those who survived still remember the effects of the nuclear blast. How can remembering such a painful event in our modern history bring me hope? Remarkably, a few generations later, we are sending the USS Ronald Reagan to Japan. This time, our ships are not there to attack with bombers. They have arrived to help. Supplies, equipment, and medical care are being offered to help our Japanese neighbors. This current crisis has opened the hearts of Americans to the Japanese people in a new way. Did the people of my great grandma’s generation ever think this was possible? After all, it was considered an act of loyalty among many of the older generations of Americans to shun the “Japs”. Yet, many of my generation born in the 70’s have friends from Japan. When we look into their eyes, we see our friends and our neighbors in need. 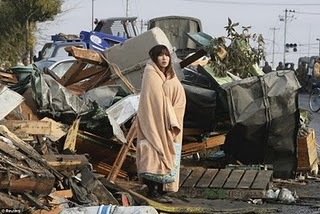 It is likely that the Tsunami of 2011 will be the defining historic wound of Japan’s young generations. This outpouring of support to Tsunami victims has shown us the possibility of healing the “infamy” and the “unforgivable”. While I do not welcome the tragedy in Northern Japan, I do see the collection of miracles that have been awakened from this crisis. 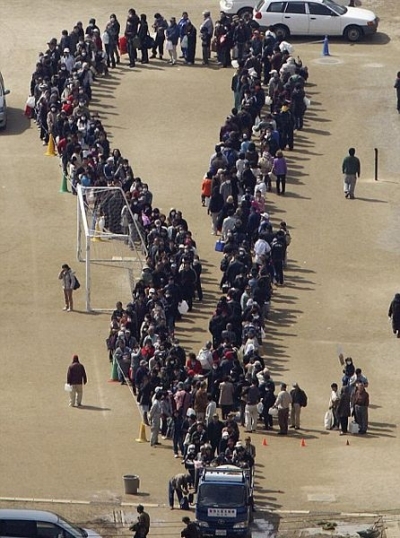 People in Japan are hungry, thirsty, tired, scared and grief stricken. Yet they work together cooperatively, with no sign of riots. A collaborative humility and a spirit of resiliency have become so clear. Age old feelings from WWII have not hindered the aid offered to Japan. As I watch the images of the Tsunami on TV, I think to myself, “That could have been me.” The record breaking earthquake could have sent a much more powerful wave to these Pacific Islands. The ripples from Japan touched our island of O`ahu, reminding me that we are not as separate as we often believe. That elucidating reminder brings its own gift. While we cannot control nature’s expressions through storms, earthquakes, and tidal waves, we do have another power. We have the power of choice. Choosing to help each other in times of crisis is our empowering initiative. It is what we can do. The humbling power of nature is reminding us to move forward, to forgive, and to bond together in our common vulnerability. This bond, inspired by tragedy, but formed through choice, is unexpectedly helping us to heal the past. 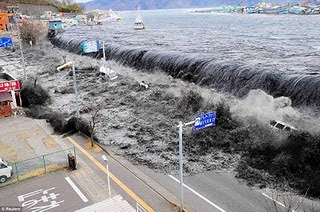 Click the above link for actual video footage of the Tsunami. there have been some comments posted on other sites about Pearl Harbor in light of the current tsunami. Feel free to post your comments here. Mahalo! I read your blog on the Jewish Journal. It's so fun! http://www.youtube.com/watch?v=xOfy1CoxrMoFor footage of the Tsunami.